Click the thumbnails to see larger images and descriptions. It was nice to see that a lot of manufacturers are getting serious about bikes for commuting. I just hope they haven't overestimated the near-term growth prospects. Good commuting bikes have always been a difficult sell, as many U.S. cyclists seem to choose their bikes based on glamour and reflected racing glory. Folks who are up for switching from automotive to bicycle commuting often focus heavily on the money-saving aspect, which is fine, and true, but often potential bike commuters get too carried away with the idea of "cheap" and think they can get by with a cheap bike. "I'm not a 'serious' cyclist, I'm just a commuter." This ignores the fact that commuting is among the most rigorous type of cycling as far as the mechanical parts are concerned, and the greater importance of durability/reliability to the commuter cyclist. Your boss may think you're a bit flaky to be commuting by bike in the first place, but then if you're half an hour late one morning 'cause one of the cheap carbon steel spokes on your bike broke and stranded you, it could be a career-threatening issue for some folks! Spending a thousand or two on a commuter bike may seem like a frivolous extravagance to those who don't understand the rigors of commting, but it's actually perfectly reasonable for many riders. 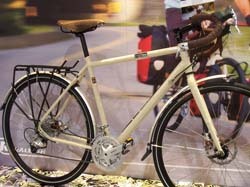 Probably the biggest buzz of the show along this line is Quality Bicycle Products' new Civia model. These are still in the prototype stage, but QBP (parent company of Surly and Salsa) has a great track record, and this should be a really interesting bike. The single item that most excited me this year is a very small one, the Wheels, Inc. emergency replacement derailer hanger. This is a clever little gimmick that is held in place by your quick release skewer, allowing you to get home with almost a full range of gears even after trashing your original derailer hanger. 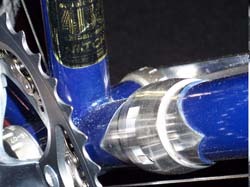 It's fairly thick, so your derailer may not have sufficient travel to reach the lowest gear on your cluster, but that is a small price to play. This is a small, very light item, and could save you from a looooooong walk one day. 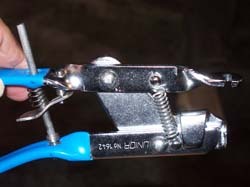 It's also available as a part of a nifty little on-the-road mini-tool set. Great news! Shimano has updated my favorite Shimano group, Sora! At long last, there is now a 9-speed version. Better yet, it includes the ergonomic improvements introduced in Dura-Ace STI levers in 2004, and the nifty gear indicator introduced in Tiagra last year! The new Sora brifters lack the reach adjustment screw of the older version, but come with two different sizes of adjustment wedges, so they are still a great choice for riders with short fingers. 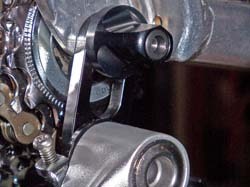 They still have the "Campagnolo style" thumb release levers on the inside of the shfiters, a favorite feature of mine, since it elminates the confusion of other STI levers, where the same motion is used for upshifting as for downshifting. 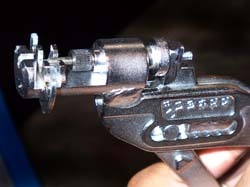 I do dearly hope that the 7-speed Soras will still be supplied, though...we sell a lot of these for upgrading classic bikes to handlebar shifting. 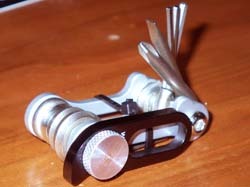 I'm a BIG fan of Shimano's SPD pedal system, it's all I ride. 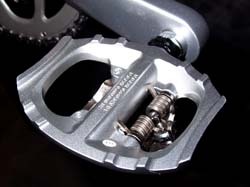 They have made a two way version for quite a while, with one side being fitted with an SPD cleat, the other side like a generic toe-clippable MTB pedal. I've used these on several of my own bikes, and currently run them on my Greenspeed. The thing is that the toe-clippable design of the non-SPD side never really made much sense. 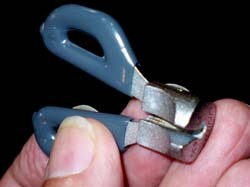 If you were to install toe clips, you wouldn't be able to use the SPD side, 'cause the clips would drag on the ground! This new model, not yet even in the catalogue, is a much nicer design. The non-SPD side has a nicely curved foot bed that should be quite comfortable even for soft-soled street shoes. 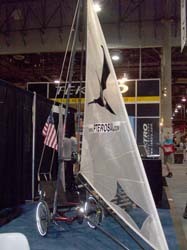 I stopped by the Swobo booth, and finally connected with Sky Yeager. 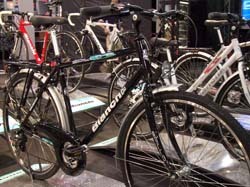 Sky was the bike designer for Bianchi U.S.A. for many years, and is responsible for the Volpe, the Boss, the Pista and many of Bianchi's other innovative models. I've known and admired her work for many years, but our paths had never crossed before. Had a nice chat with her, saw some of the nice bikes she has designed for her new line at Swobo. This is a clever alternative to traditional bike hanging hooks, with a pair of spring-loaded jaws that grab the wheel of your bike with less fussiness and hassle than traditional hooks require. Not currenly in production, but looks like it has some potential. For many years, Raleigh bikes all came with Brooks saddles. 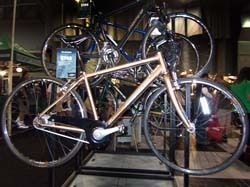 In the late '70s, when Raleigh USA parted company with Raleigh UK, that ended. Brooks fans like myself are delighted to see that Raleigh USA has brought back the unequalled Brooks saddles on a couple of their 2008 models! The One Way fixed-gear, already a favorite, sorry, favoUrite of mine gets a pre-aged B.17 this year, and also comes with Brooks leather handlebar tape. In addition, there's a new touring model with the same saddle and tape. This touring model, expected to retail for around $1100 looks like a real winner, featuring Avid disc brake, Tektro brakes, 9-speed bar-end shifters on cool WTB handlebars. 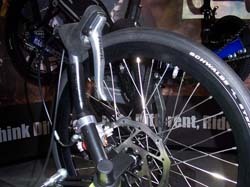 Disc brakes have been somewhat problematical for touring bikes in the past mainly because, in many installations, they make it difficult or impossible to install fenders and luggage racks. Fortunately, this bike comes with fenders and a very nice rear rack already installed, so that's no longer a problem! Lots of trikes at this show. I test rode a couple of them. I'm particularly interested in trikes these days, now that I can no longer ride bicycles. Dave Lundegard showed me E.A.I. 's new super-deluxe track sprockets. The photo really does't do it justice, it's just gorgeous! However, it's not about bling. These are the finest track sprockets ever. E.A.I. has a special custom designed tooth profile to make them run smooth and quiet even brand new, no break-in needed. The gold color is a high-tech titanium-nitride plating that is much harder and more wear resistant than the underlying steel. 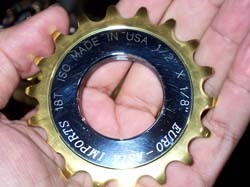 If you want the very best, and don't mind paying $120 for a single sprocket, this is just the thing! There's been a lot of buzz about this item, and I've been a bit slow to pick up on it as it seemed "too good to be true." I got to briefly ride a demonstrator, and also a tricycle with one of these hubs fitted, and it begins to look as if this might be the real thing. I'm going to install one on my Greenspeed and give it a real try on the road. It's going to be a bit of a challenge to mount such a large hub into such a small wheel, but I think it should be doable. Speaking of internal gear hubs, Sram's iMotion 9-speed is now in production in several freewheeling (no coaster brake) versions, but still not available in the U.S. aftermarket. We were one of the very first Adams Trail a Bike dealers, have liked the line very much from the beginning. 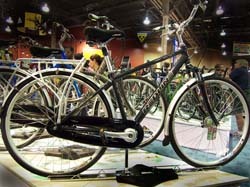 We also used to sell their tandem version, and we missed it when it was discontinued. I regularly get email requests from desperate parents wanting to know if we have any of them left. I've been sorry to disappoint them, but they went extinct several years back. 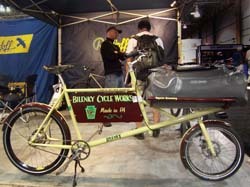 Speaking of trailercycles...the Burley Piccolo is back! Burley has been going through some hard times, and the new owners were forced to retrench heavily to keep the company afloat. They had cut the line down to just the two wheeled trailers and strollers, discontinuing all of their bicycle and clothing lines, and the Piccolo, the best trailercycle there is. 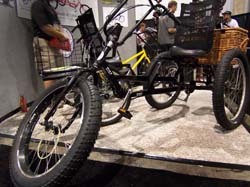 Fortunately, they've now re-introduced the Piccolo, and a similar, but less expensive single speed version. Another piece of good news from Burley is that they are now also available through Quality Bicycle Products. They've got a neat looking bluetooth stereo headset for smart phones...I'm gonna get one for my Palm Treo 700P. It will let me listen to music in stereo and also make phone calls with the same headset! It has the in-the-ear type of phones that I use with my iPod. I'm eagerly awaiting mine. They've also got a couple of clever add-on devices that turn your PDA/smartphone into a GPS unit, with lots of options for tracking rides, including topo map data. I've always found the folks from Surly especially sympatico, and I closed both days I was at the show by visiting their booth, which was a great party. I love these guys! 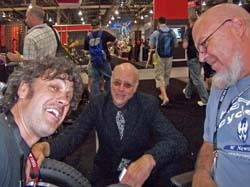 The second day, Gary Fisher showed up and we had a great chat. He was sharply dressed as ever, this time in a fuzzy tufted black suit that I really can't describe. 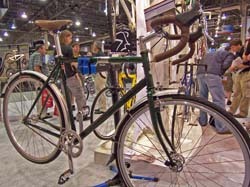 The big news from Surly was the new Travelers-Check. Their Cross-Check cyclocross/do-anything frame has been a huge success, and the Travelers-Check is a version with S&S couplers, for the cyclist on the go! This should be a big seller for them, I hope their production will be able to keep up with the demand! In addition to exotic beer, Surly had particularly cool schwag this year: yard-long toe straps, so you can ride wearing your clown shoes! I got a couple of 'em. These days I just ride SPDs but toe straps remain one of the most useful things going. I use 'em to carry strap my canes to my Greenspeed trike when I'm riding it so I'll still be able to walk when I get where I'm going, and they're useful for dozens of other purposes as well. I anticipate that the long Surly straps will be even more useful, even for those of us who don't cycle in clown shoes. 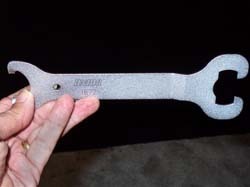 Unior is the new name of an old tool manufacturer. They're located in Slovenia, (formerly part of Yugoslavia) and they formerly made many of the shop tools sold under the ELDI brand name. 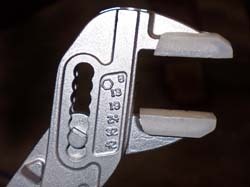 They have a very extensive line of tools, and a few that are in a category by themselves. Cycling.tv has an internal TV show at Interbike, and I was on their "Good Morning Interbike" segment, interviewed by Richard Fries. 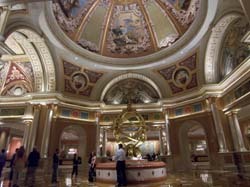 This year we stayed at the Venetian, rather than the Stratosphere as in recent years. 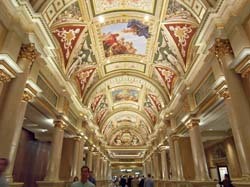 Partly this was to avoid having to take taxicabs back and forth (the Venetian is adjacent and connected to the Sands Expo Center where the show is held.) This was much more convenient. I was able to zip back and forth between the room I shared with Tom Quinn and the show in my electric scooter. 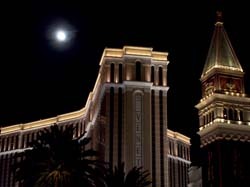 In addition, the Venetian is just a gorgeous hotel, with very nice decor and lots of amenities. Our room was astonishingly posh. It had three flat screen TVs in it, one of them in the bathroom! The drapes were operated by a remote control, and all of the fitments were first class. There was a nice view, and the room was completely soundproof as far as we could tell. We never heard any sound from outside the room, and even the ventilation/cooling system was inaudible unless you stood right next to the huge windows. I even tried to sign up to use my Treo 700P as a bluetooth modem, but after spending a bunch of time on the phone with Verizon, it turns out they don't have a Mac driver to work with it! 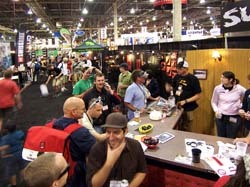 Bikesnob's Blog has a nice Interbike report too.